Atherosclerosis is a multifactorial disorder, which affects the arterial wall. It has been reported that, hypothyroidism and thyroid hormone deficiency are related to cardiovascular disorders. Also, endothelial dysfunction plays an essential role in the development of atherosclerosis. We aimed to evaluate the effects of thyroid-stimulating hormone (TSH) on pro-inflammatory tumor necrosis factor-α (TNF-α), interleukin-6 (IL-6), angiogenic vascular endothelial growth factor (VEGF) and leukocyte adhesion, intercellular adhesion molecule 1 (ICAM-1) and E-selectin in human umbilical vein endothelial cells (HUVECs). In this study, HUVEC cells were treated with 1 and 2 μM of TSH in different treatment times. The gene and protein expression of ICAM-1, VEGF, and E-selectin were performed by real-time polymerase chain reaction and western blotting, respectively. Likewise, TNF-α and IL-6 protein levels were determined by the ELISA method. VEGF, ICAM-1, and E-selectin as endothelial dysfunction markers and also, TNF-α and IL-6 as pro-inflammatory cytokines were detectable in HUVEC. Besides, the results of this study revealed that TSH treatment down-regulates TNF-α and IL-6. Evaluating the gene and protein expression data revealed the upregulation of ICAM-1, E-selectin, and VEGF in TSH treated cases in different periods of exposure. Considering the multiple actions of TSH, it could be concluded that TSH plays a controversial role in atherogenesis by anti-inflammatory effects and on the other side, angiogenesis and leukocyte adhesion induction which is related to vascular cell proliferation. Impaired thyroid hormones metabolism may be considered as a cause of various heart disorders and abnormal endothelial function ,,. Indeed, thyroid hormone deficiency and hypothyroidism are related to defects in the secretion of endothelium-dependent dilation factors ,. The levels of thyroid stimulating hormone (TSH) are increased in subclinical hypothyroidism which has been related to elevated cardiovascular risk in epidemiological surveys . TSH activity is exerted on a definite cell membrane. TSH receptors are controlled by a thyroid-specific growth factor. Based on a recent report, the presence of TSH receptor has been shown in extra-thyroid organs, with unidentified functions. Data shown that TSH, plays an essential function in hepatic cholesterol production and increased total blood cholesterol levels. Also, considering that the TSH receptor is presented in HUVECs, it has been indicated that, TSH exposure stimulates tumor necrosis factor-α (TNF-α) which is a pro-inflammatory factor  and related stigma ,,. Also, a positive relationship among endothelium-relates vasodilation and TNF-α and interleukin-6 (IL-6), were reported in hypothyroid patients . Likewise, TSH stimulates IL-6 release from 3T3-L1 adipocytes . On the other side, since adhesion molecules are engaged in inflammation phenomena, the study of these factors is imperative. In this regards, reports shown that patients with subclinical hypothyroidism had noticeably elevated levels of intercellular adhesion molecule-1 (ICAM-1) versus healthy subjects . In this regards it could be deduced that, the vascular inflammatory reaction involves intricate interactions among inflammatory cells, endothelial cells, vascular smooth muscle cells, and the extracellular matrix. Therefore, vascular damage is related to elevated levels of adhesion molecules expression by endothelial cells and the role of inflammatory cells, growth factors, and cytokines . According to the previous studies, TNF as an inflammatory cytokine plays an imperative role in vascular disturbance in experimental surveys ,. Some cellular phenomena like leukocytes adhesion, and invasion of vascular cells arise with the pro-inflammatory cytokines including IL-6, which plays a key role in atherosclerosis ,. In addition, pro-inflammatory cytokines and TNF-α have promotive effects on the production of the ICAM-1 on cultured endothelial and epithelial cells. It is possible that this effect plays an essential role in inflammation regulation. It has been reported that, IL-6 resulted to oxidative stress and endothelial dysfunction induction by affecting the angiotensin II receptor . On the other hand, TNF-α activates NF-κB which results to E-selectin gene expression with reactive oxygen species (ROS) production. Indeed, the formation of ROS in endothelial cells is prompted by inflammatory cytokines such as TNF-α . Considering the fact that the vascular endothelial growth factor potently induced angiogenesis, there is an evidence showing that TNF-α had an antiangiogenic effect that was impressed by the vascular endothelial growth factor (VEGF)-definite angiogenic way . Since, impaired vascular function had multifactorial etiology that is associated with aging, inflammation, injury, hyperlipidaemia and several other elements which are engaged in the pathogenesis of atherosclerosis . Therefore, this study evaluated the TSH effects on pro-inflammatory factors such as TNF-α and IL-6, accompanied by endothelial dysfunction markers (VEGF, E-selectin, and ICAM-1) which are related to atherosclerosis induction in HUVECs. The aim of our survey was to evaluate the TSH effects on the HUVEC as assignee of vascular endothelial cells to evaluate whether change in TSH level could affect the endothelial function or not. Indeed, we investigated the possible effects of TSH on the endothelial dysfunction which, these TSH effects and also altered levels of ICAM-1, E-selectin, and VEGF (that have major roles in endothelial function)  might be the essential factors in atherosclerosis progression. TSH was purchased in powdered from Sigma Aldrich Company (Cat No: T1775, Sigma, USA) and dissolved in distilled water. TNF-α and IL-6 enzyme-linked immunosorbent assay (ELISA) kit were obtained from IBL International GmBH (Hamburg, Germany). RNA purification and cDNA synthesis kit were purchased from GeneAll Company (South Korea). A real time polymerase chain reaction (PCR) master mix was prepared from Ampliqon (Denmark). Western blot materials were purchased from Bio-Rad Inc. Cell culture materials were obtained from Biowest, France. HUVECs were purchased from the Pasteur institute of Iran (Tehran, I.R. Iran). The HUVEC cells were seeded in a complete medium containing Dulbecco's modified eagle medium (DMEM)/F12 with 10% fetal bovine serum (FBS) and 1% penicillin/streptomycin and the cells were incubated in a 5% CO2-humidified incubator at 37 °C. The HUVEC cells had a flagging morphology in all cell cultures. In order to evaluate the effects of TSH, 1 × 106 HUVEC cells were seeded 24 h before treatments in the FBS free medium. Thereafter, cells were treated with different doses of TSH (1 and 2 μM) for 24 and 48 h in the FBS free medium, according to a previous similar survey . IL-6 and TNF-α levels were determined by the ELISA method and 5 × 103/well of HUVEC cells were cultured in 96-well plates overnight before treatments. Subsequently, the cells were treated with TSH (1 and 2 μM) for 12, 24, and 48 h. After the period of exposure, the cells culture plates centrifuged in 1500 g for 5 min and then the cell supernatant collected. In following, protein levels evaluations according to the ELISA kit protocols. In the following, 100 μL of a standard solution was added to each well. The well blank was prepared by adding 100 μL of the sample diluent. In addition, 50 μL of the sample diluent was added to each sample well, after 50 μL of the treated sample were poured. Then, conjugate biotin was added and maintained for 2 h at room temperature (18-25 °C). After the period of incubation, streptavidin-HRP was added and maintained at room temperature for 1 h. At that time, washing with phosphate buffered saline (PBS) (pH 7.4) was performed. Incubating with tetramethylbenzidine as substrate was done at room temperature. By ELISA reader, the absorbance of each sample at 450 nm was quantified. Cells (106/well) were grown in 6-well plates 24 h before exposure to TSH. To evaluate the effects of TSH treatments on the mRNA level of ICAM-1, E-selectin, and VEGF, the cells were treated with different concentrations (1 and 2 μM) of TSH for 24 and 48 h. Total RNA was purified by GeneAll kit (cat.No. : 305-101) according to the manufacturer's instructions. RNA integrity was evaluated by gel electrophoresis. Two μL of total RNA was utilized for cDNA synthesis. Real time-PCR was performed by Ampliqon master mix (cat. No. : A325402) with specific forward and reverse primers for all genes (with two replicates). β-actin mRNA was evaluated as the internal control to normalize gene expression. Primer sequences used for of ICAM-1, E-selectin, VEGF, and β-actin are listed in [Table 1]. The mRNA levels of ICAM-1, E-selectin, and VEGF were normalized to β-actin mRNA levels. PCR was run as 40 cycles at 95 °C for 15 s, 62 °C for 30 s, and 72 °C for 30 s. The negative controls for each target showed an absence of carryover. Data of target mRNA copies were calculated relative to β-actin using the 2-ΔCt method. In order to evaluate the effects of TSH on the protein expression of ICAM, VEGF, and E-selectin, 106 HUVEC cells were seeded and treated with TSH (1 and 2 μM). After 6 and 24 h of exposure, the cells were washed with PBS (pH 7.4) and then trypsinized. After calculating the number of treated cells, isolated HUVEC cells were lysed and centrifuged at 16000 g for 15 min at 4 °C. Then, supernatants were utilized for protein detection. Proteins were measured by the Bradford method. Proteins specimens were separated by SDS-polyacrylamide gel and transferred to polyvinylidene difluoride (PVDF) membranes. The blots were blocked in 5% skim milk solution at room temperature. In the following, the PVDF membrane was incubated overnight with a primary antibody, anti-ICAM-1, E-selectin, and β-actin (Santa Cruz, USA). After washing the membrane, incubation was done with a secondary antibody (with horseradish peroxidase-conjugated anti-mouse) for 3 h. The immunoblots were incubated with Amersham ECL western blotting detection reagent (GE Healthcare Life Science, Boston, MA, USA), followed by exposure to X-ray film. To evaluate the bond densities of the proteins, the Image J software was used to analyze the densities. Each protein band was normalized to β-actin bands. The presented data were analyzed by SPSS software, version 21.0 (SPSS, Inc.) and GraphPad Prism (version 6.01). Real-time PCR and ELISA data are presented as the mean ± SD. In order to evaluate the differences between means, t-tests was used to compare each group with the control. For multiple analyses between groups, One-Way ANOVA was applied. Statistical differences were considered at P < 0.05. In order to examine the effects of TSH on endothelial cells, the expression of TNF-α and IL-6 levels as pro-inflammatory factors was evaluated by ELISA methods. The cells were exposed to different concentrations of TSH (1 and 2 μM) for 12, 24, and 48 h. The results of this study showed that TSH remarkably down-regulated the TNF-α levels.in all treatment periods. As shown in [Figure 1], there was a significant decrease in TNF-α in TSH treated cells, when compared to the untreated controls in all exposure times (P < 0.05). In further analysis, there were no significant differences in cells treated with 2 μM TSH, as compared to cells treated with to 1 μM TSH in all examined incubation times (P > 0.05). Figure 1: Down regulation of tumor necrosis factor-α (TNF-α) level in HUVECs by thyroid-stimulating hormone (TSH) exposure. After treatments with TSH (1 and 2 μM) for 12, 24, and 48 h, protein expression evaluated by ELISA method. * Indicates significant differences (P < 0.05) compared to control group. Data are presented as mean ± SD values derived from three independent experiments. The results obtained from IL-6 analysis [Figure 2] revealed that TSH down-regulated IL-6 levels in the 12 h treatment period (P < 0.01). In the case of 24 and 48 h incubation periods, there was a decrease in the IL-6 levels compared to the control, but these differences did not reach significant levels (P > 0.05). As presented in [Figure 2], there was a significant decrease in IL-6 levels of 1 and 2 μM TSH treated cells, in comparison to the controls in all exposure times (P < 0.01). Figure 2: Down regulation of interleukin-6 (IL-6) levels in HUVECs by thyroid-stimulating hormone (TSH) exposure. After treatments with TSH (1 and 2 μM) for 12, 24, and 48 h, protein expression evaluated by ELISA method. * Indicates significant differences (P < 0.05) compared to control group. Data presented as mean ± SD values derived from three independent experiments. In order to investigate the effects of TSH on the gene expression of VEGF, ICAM-1, and E-selectin on endothelial cells, the mRNA levels of adhesion and angiogenic related factors were evaluated by the real-time PCR method. The cells were treated with different doses of TSH (1 and 2 μM) for 24 and 48 h. Real time-PCR results showed that treatment with TSH (1 and 2 μM) for 24 h increased the expression of E-selectin mRNA ([Figure 3]A; P < 0.01, P > 0.05, respectively). As shown in [Figure 3]B, the E-selectin mRNA levels became slowly elevated over 48 h of treatment with 2 μM of TSH compared to 1 μM. The amount of increase recorded using 1 μM TSH was higher compared to that for 2 μM (P < 0.01). Moreover, for the treatment conducted in 24 h, the E-selectin mRNA levels of HUVEC (2 μM) increased insignificantly in comparison to the control (P > 0.05). Between varying doses in 48 h treatment time, there was a significantly elevated level of E-selectin in 2 μM compared to 1 μM [Figure 3]B. These data indicated that the up-regulation of E-selectin during 48 h was concentration dependent. Consequent upon exposure to different concentrations of TSH, the E-selectin levels in a dose of 2 μM increased significantly in comparison to 1 μM treatments. Based on the real time-PCR data analysis presented in [Figure 4]A, the ICAM-1 mRNA levels increased significantly over 24 h of treatment with 1 and 2 μM TSH (P < 0.01). By comparing between various doses in the 48 h treatment time, there were elevated levels of ICAM-1 in 2 μM (P < 0.01) and 1 μM (P < 0.01) doses in comparison to the controls [Figure 4]B. Furthermore, in comparison with the different doses of TSH, the ICAM-1 mRNA levels of HUVEC (1 μM) had a higher level than 2 μM in the case of 24 and 48 h exposure (P > 0.05). Figure 3: mRNA levels of E-selectin in HUVECs cells treated by thyroid-stimulating hormone (TSH) (1 and 2 μM) for (A) 24 h and (B) 48 h exposure times. Data presented as mean fold change ± SD values derived from three independent experiments. *P < 0.01. Figure 4: mRNA levels of intercellular adhesion molecule 1 (ICAM-1) in HUVECs cells treated by thyroid-stimulating hormone (TSH) (1 and 2 μM) for (A) 24 h and (B) 48 h exposure times. Data presented as mean fold change ± SD values derived from three independent experiments. *P < 0.01. As presented in [Figure 5]A, the results indicated that the VEGF mRNA levels in 1 and 2 μM TSH increased significantly over 24 h of the treatment (P < 0.05). In addition, in comparison with the different doses of TSH, the VEGF mRNA levels of HUVEC (1 μM) recorded significant differences to 2 μM TSH in the case of 24 h exposure. In addition, the VEGF mRNA levels of HUVEC treated with 1 μM TSH had significant differences in comparison to the control. Figure 5: mRNA levels of vascular endothelial growth factor (VEGF) in HUVECs cells treated by thyroid-stimulating hormone (TSH) (1 and 2 μM) for (A) 24 h and (B) 48 h exposure times. Data presented as mean fold change ± SD values derived from three independent experiments. *P < 0.05, **P < 0.01. In 48 h incubation with TSH [Figure 5]B, similar results were obtained in comparison to 24 h. Indeed, between the different doses in the 48 h treatment time, there was an elevated level of VEGF in 2 μM than 1 μM (P < 0.05). These data indicated that the regulation of VEGF during 24 h and 48 h, depended on the concentration. 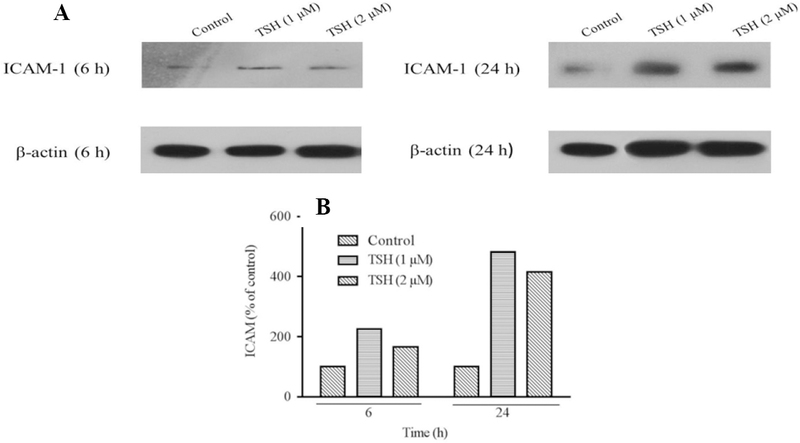 According to the results of the western blotting analysis by Image J software as presented in [Figure 6]A and [Figure 6]B, the ICAM-1 protein levels were elevated over 6 and 24 h of treatment with 1 and 2 μM of TSH in comparison to the control. Besides, among the different doses of TSH, the ICAM-1 expression in 1 μM dose of TSH treated cases had higher levels in comparison to 2 μM in 6 and 24 h. The amount of increase (ICAM-1 protein expression) over 24 h was higher than that obtained during the 6 h treatment time. According to western blotting results, the protein expression levels in the examined doses (24 h) were parallel to the real-time PCR data. Figure 6: Prortein detection for evaluation of E-selectin expression performed using western blotting technique. 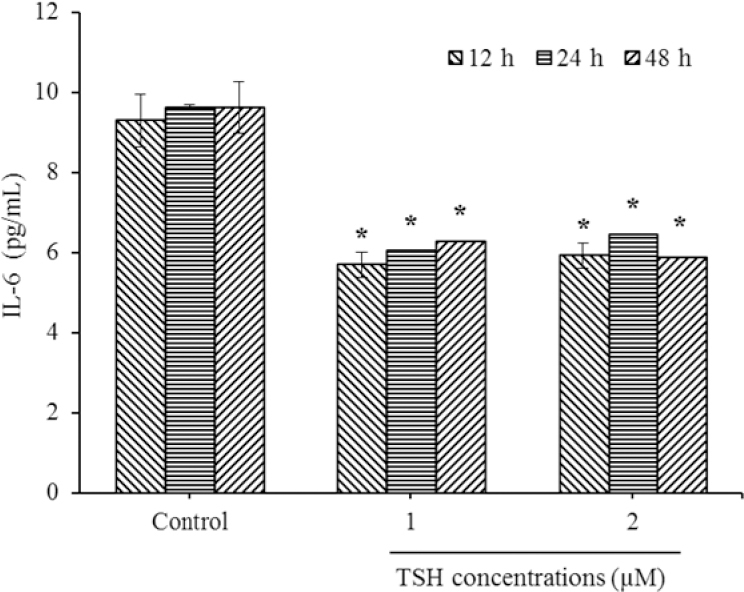 (A) Protein expression levels of E-selectin in HUVECs cells treated by thyroid-stimulating hormone (TSH) (1 and 2 μM) for 6 and 24 h and (B) TSH treatment significantly increased relative expression of E-selectin. For analysis protein's bands densities, Image J software was used to analyze the densities. Each protein (in one repeat) bands normalized to β-actin bands. 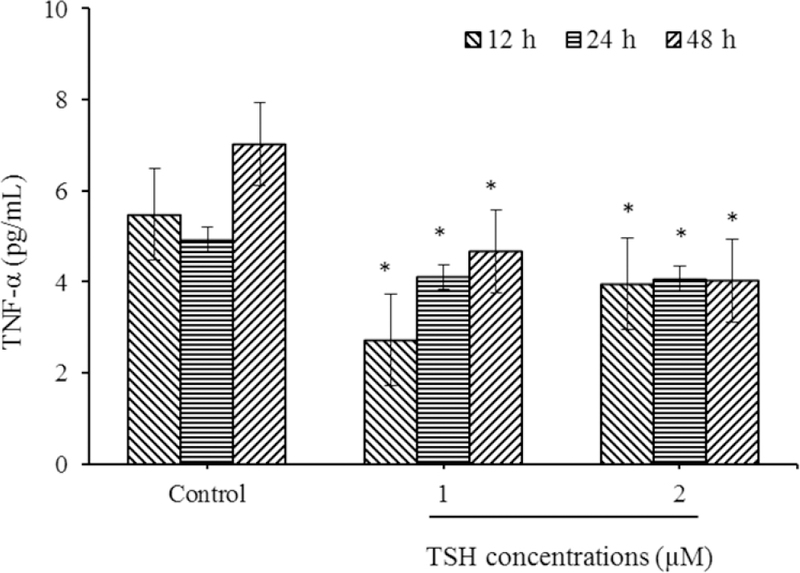 Analysis of western blotting protein bands showed that, the E-selectin protein levels increased over 6 and 24 h of treatment with 1 and 2 μM of TSH in comparison to the control [Figure 7]A and [Figure 7]B. Moreover, between different doses of TSH, the E-selectin protein levels in a concentration of 2 μM was higher in comparison to 1 μM over the 24 h period. In contrast, in the 6 h incubation period, a higher protein expression was present in the 2 μM dose. Figure 7: Prortein detection for evaluation of E-selectin expression performed using western blotting technique. 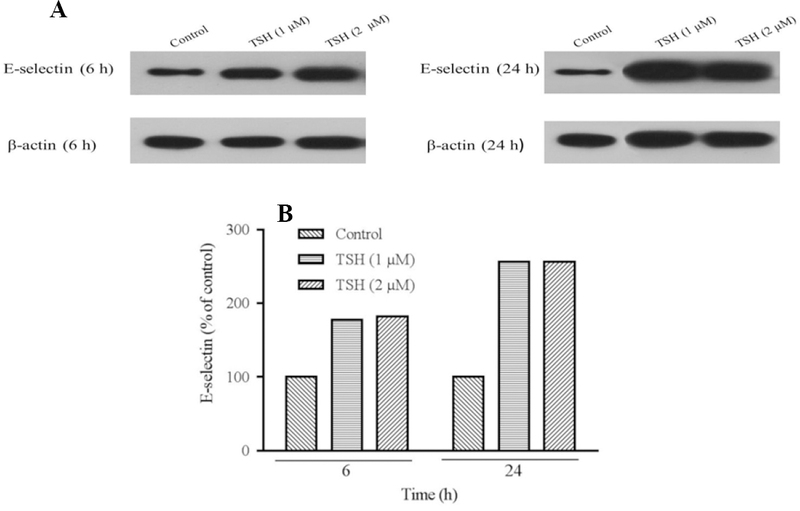 (A) Protein expression levels of E-selectin in HUVECs cells treated by thyroid-stimulating hormone (TSH) (1 and 2 μM) for 6 and 24 hand (B) TSH treatment significantly increased relative expression of E-selectin. For analysis protein's bands densities, Image J software was used to analyze the densities. Each protein (in one repeat) bands normalized to β-actin bands. The present survey evaluated the direct effect of TSH hormone in HUVEC. Indeed, TSH changes the levels of pro-inflammatory and angiogenic factors. Based on our results, TSH down-regulated the IL-6 protein levels in different treatment times. The amount of decrease was more noticeable in 12 h treated cells. In addition, our findings showed that TSH decreased the TNF-α level in all treatment times. IL-6 has been recognized as a novel cytokine that is synthesized by numerous tissues, which is a major regulator of defense responses. One of the main effects of IL-6 is the stimulation of acute phase protein production, and the induction of lymphocytes development . The present research showed that HUVEC is a source of IL-6 and TNF-α. According to previous studies, cytokine IL-6 has been suggested as the main factor in the suppression of thyroid action during no thyroidal disorder . Also, Antunes et al. in a similar survey reported that, TSH increases the release of IL-6 from adipocytes. These results were not parallel to our findings. This discordance may be related to the different cell lines and selected doses . Another survey by Diez et al. showed that in patients with hypothyroidism, TNF-α and sTNFR-I levels were higher in comparison to normal individuals . However, this was not relevant to our results. It could be stated that hypothyroidism is a multifactorial disorder that affected TNF-α in the study of Diez et al., but our survey evaluated the effects of TSH only on TNF-α at the cellular level. Indeed, according to the author's knowledge, the present study is the first to investigate the effects of TSH on pro-inflammatory factors such as TNF-α and IL-6 on HUVEC. According to results of previous survey, TSH play major role as negative regulator of cytokine signaling (suppressor of cytokine signaling) (SOCSs) protein, that led to change in the signal transducers and activators of transcription (STAT) factors phosphorylation. It could be deduced that TSH signaling cooperates with the JAK-STAT pathway; therefore, there is signaling mutual impacts among TSH and cytokines SOCSs which exert a possible multiple biological functions that intervened by their SOCS box, Src homology 2 domain, and GTPase domain ,. In addition, based on previous studies , which led to Th1-skewing reticence results in TNF-a synthesis inhibition. It could be deduced that, TSH exerted its effects on SOCS and triggers the signaling of cAMP , leading to interruption of the JAK-STAT pathway, and NF-kB activation ,, which resulted in inhibition of TNF-α and IL-6 expression levels. Previous reports show that, in FRTL-5 cells, TSH and forskolin decrease the steady state of major histocompatibility complex class land ICAM-1 mRNA expression levels; besides, TSH/cAMP inhibit cytokines (interferon-γ and TNF-α)-mediated maximal ICAM-1 mRNA expression ,. In evaluating the effects of TSH on the expression levels of ICAM-1 and E-selectin as leukocyte adhesion molecules and VEGF as angiogenesis related factor, it could be suggested that, TSH by interacting with specific receptors on the HUVEC, induces angiogenesis (VEGF), and leukocyte adhesion (ICAM-1 and E-selectin). Endothelial dysfunction is related to increased atherosclerosis risk, which is accompanied by the elevated expression of leukocyte adhesion, cell penetrability, and proliferation of vascular smooth muscle cells . VEGF is an essential angiogenic element, which promotes endothelial cells proliferation and increase vascular penetrability. VEGF may play a noticeable role in atherosclerosis progression . TSH has a specific receptor that triggers the progression of two signaling pathways which include the adenylatecyclase-protein kinase A (PKA) and the phospholipase C-protein kinase C (PKC) pathways . As G-proteins-coupled receptors, TSH receptors have stimulatory effects on cAMP and phospholipase C-dependent pathways ,. A previous study performed by Balzan et al., showed the effects of TSH on angiogenesis by interaction with its receptor that was modulated with the cAMP-mammalian target of rapamycin signaling. They reported that, this impact is dependent on VEGF in human microvascular endothelial cells  which is in accordance with our data and may suggest the possible mechanism of TSH effects in our study. Similar to our results, Hoffmann et al. indicated that, TSH increases VEGF production in several ways including the PKC, more than the PKA pathway in thyroid cancer cell lines , this was in accordance with our findings. An et al. reported that TSH and forskolin decrease the ICAM-1 mRNA levels in FRTL-5 thyroid cells  and this does not agree with our data. This discordance might be related to the different activated signaling pathways in the FRTL-5 cells compared to HUVEC. In a similar survey, Desieri et al. evaluated the effects of human recombinant TSH on biomarkers of vascular endothelial cell related factor. After human recombinant TSH administration, serum TSH was elevated. Concurrently, plasma sICAM-1 concentrations increased significantly as E-selectin , and these data are in parallel our results. Overall, according to results from the presented study, in evaluating the effects of TSH on the gene and protein expression levels of ICAM-1, E-selectin, and VEGF, it had been confirmed that, TSH has a specific receptor on the endothelial cells, which induces multiple effects including the down-regulation of anti-inflammatory factors (TNF-α and IL-6) in addition to the induction of angiogenesis (VEGF), and leukocyte adhesion (ICAM-1 and E-selectin). In this regards, the elevated expression of leukocyte adhesion molecules is related to endothelial dysfunction and increased risk of atherosclerosis. Based on our findings, this theory arises that TSH could play a controversial role in atherogenesis by anti-inflammatory effects and conversely, angiogenesis and leukocyte adhesion induction resulted to vascular cell proliferation. Further studies should be conducted to evaluate the effect of TSH on atherosclerosis by evaluating the numerous pro-inflammatory and proliferative factors in different cell lines and animal models. This research was financially supported (Grant No. 9501432787) by The Urmia University of Medical Sciences, Urmia, I.R. Iran. We are thankful to the technicians of Cellular and Molecular Research Center, Urmia, I.R. Iran for their technical helps. Tian L, Zhang L, Liu J, Guo T, Gao C, Ni J. Effects of TSH on the function of human umbilical vein endothelial cells. J Clin Mol Endocrinol. 2014;52(2):215-222. Coceani M, Iervasi G, Pingitore A, Carpeggiani C, L'Abbate A. Thyroid hormone and coronary artery disease: from clinical correlations to prognostic implications. Clin Cardiol. 2009;32(7):380-385. Mayer O Jr, Šimon J, Filipovský J, Plášková M, Pikner R. Hypothyroidism in coronary heart disease and its relation to selected risk factors. Vasc Health Risk Manag. 2006;2(4):499-506. Cai Y, Manio MM, Leung GP, Xu A, Tang EH, Vanhoutte PM. Thyroid hormone affects both endothelial and vascular smooth muscle cells in rat arteries. Eur J Pharmacol. 2015;747:18-28. Antunes TT, Gagnon A, Bell A, Sorisky A. Thyroid-stimulating hormone stimulates interleukin-6 release from 3T3-L1 adipocytes through a cAMP-protein kinase a pathway. Obes Res. 2005;13(12):2066-2071. Balzan S, Del Carratore R, Nicolini G, Beffy P, Lubrano V, Forini F, et al. Proangiogenic effect of TSH in human microvascular endothelial cells through its membrane receptor. J Clin Endocrinol Metab. 2012;97(5):1763-1770. Tian L, Song Y, Xing M, Zhang W, Ning G, Li X, et al. A novel role for thyroid-stimulating hormone: up-regulation of hepatic 3-hydroxy-3-methyl-glutaryl-coenzyme a reductase expression through the cyclic adenosine monophosphate/protein kinase A/cyclic adenosine monophosphate-responsive element binding protein pathway. Hepatology. 2010;52(4):1401-1409. Zhang W, Tian Lm, Han Y, Ma Hy, Wang Lc, Guo J, et al. Presence of thyrotropin receptor in hepatocytes: not a case of illegitimate transcription. J Cell Mol Med. 2009;13(11-12):4636-4642. Türemen EE, Çetinarslan B, Sahin T, Cantürk Z, Tarkun I. Endothelial dysfunction and low grade chronic inflammation in subclinical hypothyroidism due to autoimmune thyroiditis. Endocr J. 2011;58(5):349-354. Bilgir F, Bilgir O, Calan M, Calan O, Isikyakar T. Subclinical hypothyroidism: Comparison of adhesion molecule levels before and after levothyroxine therapy. J Int Med Res. 2014;42(3):806-814. Zhang H, Park Y, Wu J, Chen Xp, Lee S, Yang J, et al. Role of TNF-α in vascular dysfunction. Clin Sci (Lond). 2009;116(3):219-230. Wassmann S, Stumpf M, Strehlow K, Schmid A, Schieffer B, Böhm M, et al. Interleukin-6 induces oxidative stress and endothelial dysfunction by overexpression of the angiotensin II type 1 receptor. Circ Res. 2004;94(4):534-541. Burke-Gaffney A, Hellewell PG. Tumour necrosis factor-α-induced ICAM-1 expression in human vascular endothelial and lung epithelial cells: modulation by tyrosine kinase inhibitors. Br J Pharmacol. 1996;119(6):1149-1158. Rahman A, Kefer J, Bando M, Niles WD, Malik AB. E-selectin expression in human endothelial cells by TNF-α-induced oxidant generation and NF-κB activation. Am J Physiol. 1998;275(3 Pt 1):L533-L544. Patterson C, Perrella MA, Endege WO, Yoshizumi M, Lee ME, Haber E. Downregulation of vascular endothelial growth factor receptors by tumor necrosis factor-alpha in cultured human vascular endothelial cells. J Clin Invest. 1996;98(2):490-496. Eteraf-Oskouei T, Akbarzadeh-Atashkhosrow A, Maghsudi M, Najafi M. Effects of salbutamol on the inflammatory parameters and angiogenesis in the rat air pouch model of inflammation. Res Pharm Sci. 2017;12(5):364-372. Tian L, Zhang L, Liu J, Guo T, Gao C, Ni J. Effects of TSH on the function of human umbilical vein endothelial cells. Clin Cardiol. 2014;52(2):215-22. Podor TJ, Jirik FR, Loskutoff DJ, Carson DA, Lotz M. Human endothelial cells produce IL-6. Lack of responses to exogenous IL-6. Ann N Y Acad Sci. 1989;557(1):374-387. Van Haasteren GA, Van der Meer MJ, Hermus AR, Linkels E, Klootwijk W, Kaptein E, et al. Different effects of continuous infusion of interleukin-1 and interleukin-6 on the hypothalamic-hypophysial-thyroid axis. Endocrinol. 1994;135(4):1336-1345. Díez JJ, Hernanz A, Medina S, Bayón C, Iglesias P. Serum concentrations of tumour necrosis factor-alpha (TNF-alpha) and soluble TNF-alpha receptor p55 in patients with hypothyroidism and hyperthyroidism before and after normalization of thyroid function. Clin Endocrinol (Oxf). 2002;57(4):515-521. Kim H, Suh JM, Hwang ES, Kim DW, Chung HK, Song JH, et al. Thyrotropin-mediated repression of class II trans-activator expression in thyroid cells: involvement of STAT3 and suppressor of cytokine signaling. J Immunol. 2003;171(2):616-627. Park ES, Kim H, Suh JM, Park SJ, Kwon OY, Kim YK, et al. Thyrotropin induces SOCS-1 (suppressor of cytokine signaling-1) and SOCS-3 in FRTL-5 thyroid cells. Mol Endocrinol. 2000;14(3):440-448. Kubo M, Hanada T, Yoshimura A. Suppressors of cytokine signaling and immunity. Nat Immunol. 2003;4(12):1169-1176. Goel R, Raju R, Maharudraiah J, Kumar GSS, Ghosh K, Kumar A, et al. A signaling network of thyroid-stimulating hormone. J Proteomics Bioinform. 2011;4(10):238-241. Sengupta TK, Schmitt EM, Ivashkiv LB. Inhibition of cytokines and JAK-STAT activation by distinct signaling pathways. Proc Natl Acad Sci U S A. 1996;93(18):9499-9504. Ivashkiv LB, Schmitt EM, Castro A. Inhibition of transcription factor Stat1 activity in mononuclear cell cultures and T cells by the cyclic AMP signaling pathway. J Immunol. 1996;157(4):1415-1421. Park E, You S, Kim H, Kwon O, Ro H, Cho B, et al. Hormone-dependent regulation of intercellular adhesion molecule-1 gene expression: cloning and analysis of 5´-regulatory region of rat intercellular adhesion molecule-1 gene in FRTL-5 cells. Thyroid. 1999;9(6):601-612. An BS, Ku BJ, Park SY, Shin JK, Lee JH, Kim YK, et al. Hormonal regulation of ICAM-1 gene expression in thyroid cells, FRTL-5. Exp Mol Med. 1997;29(1):45-51. Hadi HA, Carr CS, Al Suwaidi J. Endothelial dysfunction: cardiovascular risk factors, therapy, and outcome. Vasc Health Risk Manag. 2005;1(3):183-198. Inoue M, Itoh H, Ueda M, Naruko T, Kojima A, Komatsu R, et al. Vascular endothelial growth factor (VEGF) expression in human coronary atherosclerotic lesions: possible pathophysiological significance of VEGF in progression of atherosclerosis. Circulation. 1998;98(20):2108-2116. Hölting T, Tezelman S, Siperstein AE, Duh QY, Clark OH. Thyrotropin stimulates invasion and growth of follicular thyroid cancer cells via PKC-rather than PKA-activation. Biochem Biophys Res Commun. 1993;195(3):1230-1236. Graves PN, Davies TF. New insights into the thyroid-stimulating hormone receptor: the major antigen of Graves' disease. Endocrinol Metab Clin. 2000;29(2):267-286. Rapoport B, Chazenbalk GD, Jaume JC, McLachlan SM. The thyrotropin (TSH) receptor: interaction with TSH and autoantibodies. Endocr Rev. 1998;19(6):673-716. Hoffmann S, Hofbauer LC, Scharrenbach V, Wunderlich A, Hassan I, Lingelbach S, et al. Thyrotropin (TSH)-induced production of vascular eendothelial growth factor in thyroid cancer cells in vitro: evaluation of TSH signal transduction and of angiogenesis-stimulating growth factors. J Clin Endocrinol Metab. 2004;89(12):6139-6145. Desideri G, Bocale R, Milardi D, Ghiadoni L, Grassi D, Necozione S, et al. Enhanced proatherogenic inflammation after recombinant human TSH administration in patients monitored for thyroid cancer remnant. Clin Endocrinol (Oxf). 2009;71(3):429-433.